Enter in your mobile phone number or e-mail address and we will notify you when City Nav France/Benelux Maps MicroSD is back in stock. City Navigator Benelux / France NT provides detailed road maps and points of interest for your Garmin device, so you can navigate turn by turn to the destination of your choice. This map is provided on microSD card (with SD sleve) so just plug it into your compatible Garmin GPS and you're ready to navigate Belgium, the Netherlands, Luxembourg and France! 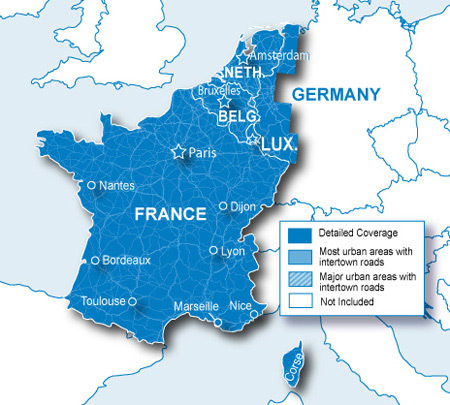 Coverage includes Belgium, the Netherlands, Luxembourg and all of France. After some initial confusion about where the micro SD was, installing the maps on my device proved easy. As I will not be using the maps until later this year I cannot judge how good the maps are at this stage, but am happy to provide further review after my holiday. Cons: Instructions could be clearer.